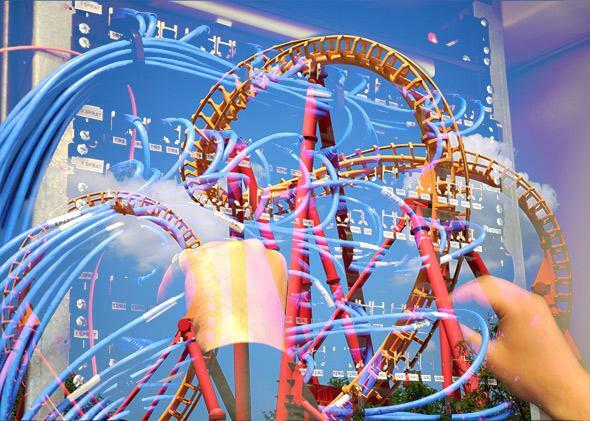 Net neutrality debate 2014: The open Internet rules roller coaster. This year was a roller coaster for net neutrality. Photo illustration by Juliana Jiménez Jaramillo. Photos by Shutterstock. “Net neutrality” became a household term in 2014. In the past 12 months, net neutrality has gone from a wonky tech policy issue to a topic of national conversation. Millions of Americans, from legions of John Oliver fans to the president himself, have weighed in on the issue and are now waiting for the Federal Communications Commission to make a decision about new open Internet rules, which we expect will come sometime in early 2015. In the meantime, here’s a look back at the net neutrality roller coaster that was 2014—and what the events of the past year may mean for the future of the open Internet. Jan. 14: The open Internet goes to court. The U.S. Court of Appeals for the District of Columbia Circuit hands down a long-awaited decision in the Verizon v. FCC case, vacating key parts of the open Internet rules that the FCC implemented in 2010. The court upholds the transparency rule but declares the no-blocking and nondiscrimination rules invalid—primarily because the FCC chose the wrong legal path to implement them. Many members of the tech policy community are unhappy, and speculation abounds about who will be the “winners” and “losers” in a world without net neutrality protections. Meanwhile, big Internet service providers like Verizon and Comcast issue public reassurances that they remain committed to Internet openness and promise that they aren’t going to start blocking content just because there aren’t any formal rules in place. Jan. 17: Reclassification is not a dirty word. Because the Verizon decision invalidated the open Internet rules based on the legal authority on which the FCC relied—and rejected Verizon’s more aggressive argument that the FCC could not regulate broadband Internet service at all—it leaves the door open for the FCC to try again to implement sound rules. So advocates on both sides almost immediately begin gearing up for a new round of sparring over net neutrality. Free Press, a consumer advocacy group, launches a campaign under the slogan: “Reclassification Is Not a Dirty Word,” arguing that the best path for the FCC to implement strong net neutrality rules once and for all is to reclassify broadband under the 1996 Telecommunications Act. (In a nutshell, reclassification would allow the agency to treat ISPs as common carriers and put strong nondiscrimination protections in place.) The FCC had previously considered reclassification in 2010, but changed course after big ISPs and telecommunications lobbyists branded it as the “nuclear option,” triggering concerns about the political battle that would ensue if the FCC went down the Title II path. Feb. 19: The FCC goes back to the drawing board. The process of creating new net neutrality rules will not be a speedy one, particularly because the FCC is an agency that makes decisions through extensive public rulemakings. The FCC establishes a new docket on the “Open Internet Remand” and solicits preliminary input on the scope of potential new rules. April 23: “Paid prioritization” proposal leaks. The Wall Street Journal reports a leaked proposal from the FCC that would create new net neutrality rules that would protect against blocking but allow some forms of “paid prioritization”—that is, broadband providers could charge companies a premium for access to faster lanes and better quality of service. Chaos ensues. Consumer advocacy groups and technology experts respond with a mix of outrage and dismay, lambasting the FCC for considering rules that would officially sanction “fast lanes” and “slow lanes” on the Internet. Some are also concerned about the legal authority on which the FCC would rely for the proposed new rules—they would be implemented under Section 706 of the Telecommunications Act rather than by reclassification. May 7: Tech companies fight back against fast lanes. More than 150 companies—from giants like Google, Facebook, and Netflix to tiny startups—send a letter to the FCC calling fast lanes a “threat to the Internet” and urging the agency to take a much stronger stance in its new rules. The unlikely partnership of fierce rivals like Google and Microsoft speak to the seriousness of the threat to their business models, while the names of dozens of smaller Internet companies and startups highlight concerns that fast lanes will squelch online innovation. May 15: FCC officially proposes new rules. The FCC issues its long-awaited Notice of Proposed Rulemaking, or NPRM, on the open Internet, a 100-page document that contains both the agency’s proposed rules as well as hundreds of additional questions about what should factor into the decision. The proposed rules look similar to the ones leaked in April, but the NPRM also extensively discusses the possibility of stronger options, including whether it should reclassify broadband as a Title II telecommunications service. So the formal legal fight begins. June 1: John Oliver ignites the trolls of the Internet in favor of net neutrality. Comedian John Oliver dedicates a 13-minute segment of his HBO show, Last Week Tonight, to a lengthy rant about net neutrality and the competing interests involved. He alternates between mocking the agency (after playing a particularly dry clip of an FCC hearing, he quips, “The cable companies have figured out the great truth of America: If you want to do something evil, put it inside something boring,” and he later refers to Chairman Tom Wheeler as a “dingo”) and eviscerating the corporate interests involved in the matter. He ends the segment with a call to action, urging the “trolls” of the Internet to go forth and submit comments to the FCC in the net neutrality proceeding. June 4: The FCC’s website crashes due to a high volume of new comments. A sudden outpouring of public comments in the net neutrality proceeding overwhelms the FCC servers, causing its electronic filing system to crash. July 18: More than 1 million initial comments filed with the FCC. The FCC receives more than 1 million submissions from the public in the first round of comments. An analysis from the Sunlight Foundation finds that more than 99 percent of the comments on record are in favor of strong net neutrality rules, with an overwhelming majority of commenters speaking out against “fast lanes” online and many urging the FCC to reclassify broadband. Sept. 10: Net neutrality docket more controversial than Janet Jackson’s breast. At 1.5 million filings and growing, the net neutrality docket is officially the largest in FCC history. The previous record was set after Janet Jackson’s infamous “wardrobe malfunction” during the 2004 Super Bowl, which generated roughly 1.4 million comments to the FCC. But apparently the public’s attention has now been thoroughly captured by the net neutrality issue. Meanwhile, big tech companies and consumer advocacy groups continue to put public pressure on the FCC by staging an “Internet Slowdown” day to demonstrate what most websites could look like in a world without open Internet protections. High-profile participants include Netflix, Twitter, Kickstarter, Mozilla, Foursquare, Reddit, Etsy, and WordPress, whose sites display pop-ups or banner advertisements with a spinning wheel and a call to action on net neutrality. Sept. 15: Deadline to submit net neutrality reply comments to the FCC. After interested parties file their responses to initial comments, an estimated 3 million comments are now in the public record, nearly double the figure released just days earlier. Oct. 30: New “hybrid” net neutrality proposal leaks. The FCC gives net neutrality advocates a Halloween scare when a new, controversial proposal leaks. It would rely on a hybrid regulatory approach, drawing heavily upon alternative theories offered by Columbia law professor Tim Wu and Mozilla earlier in the spring. The FCC’s new proposal appears to distinguish between “wholesale” and “retail” Internet service and apply common carriage protections to part, but not all, of the network. Although the exact language of the proposal is never released publicly, reports suggest that some forms of paid prioritization might still be permitted under these rules. Suffice it to say, the idea makes lots of people unhappy. Legal scholars and net neutrality advocates argue that the theory is legally risky and could actually harm the open Internet. And industry players continue to threaten legal challenges for anything that looks like Title II reclassification. Nov. 10: President Obama comes out in favor of Title II. President Obama endorses a strong, straightforward approach to net neutrality rules and urges the FCC to reclassify broadband in a detailed statement and video on the White House website. The particularly detailed statement includes explicit calls to ban paid prioritization and apply the rules equally to mobile broadband. Although Wheeler’s official response gives little insight into what the statement may mean for next steps, many speculate that Obama’s statement will force the FCC to scrap the hybrid proposal it’s been working on and go back to the drawing board yet again. Nov. 20: No draft order means no rules in 2014. In order for the FCC to vote on new net neutrality rules at its December open meeting, the chairman’s staff would have to circulate a draft of the order by Nov. 20 (so that the other commissioners could read and weigh in on the proposal) and put it on the official meeting agenda. But the day comes and goes with no word that there’s a proposal on the table. It’s clear that the FCC needs more time to weigh its options as it attempts to craft final rules—which means waiting until January or February to move ahead. In the meantime, the docket remains open for net neutrality advocates to continue to provide input to the FCC about some of the thornier legal questions in the record. As the year comes to a close, a few things are clear: The American public cares a lot about net neutrality, and the vast majority of those engaged with the issue want the FCC to implement strong, sustainable rules that will protect the open Internet. But we still don’t know what, exactly, the FCC plans to do about that fact, or how broadband providers and members of Congress will react when the FCC puts out a final rule next year. And while the momentum seems to be growing in favor of reclassification—given Wheeler’s recent remarks about Title II—there are still some open questions about the specifics of reclassification, including which provisions of Title II the FCC would actually apply to broadband providers. There’s still a long time between now and the release of final rules, and plenty of work left to be done along the way.